Set up your preferences for receiving email notifications when new blog articles are posted that match your areas of interest. Is there a topic you would like to learn more about? Let us know. Please be as specific as possible. 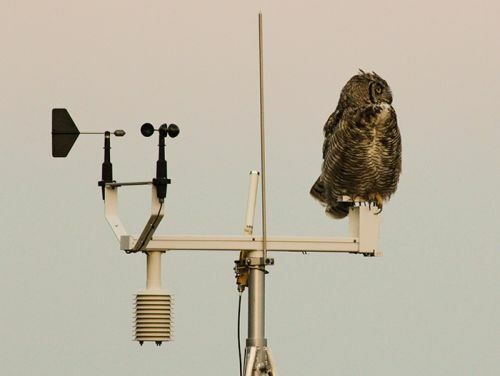 You’ve got your weather station set up and running, your data is coming across just fine, and then a bird decides your station is a wonderful place to make a home. That’s great for the bird, but not so great for the performance of your equipment or the accuracy of your data. How can you humanely encourage your new feathered friend to find a home someplace else? In this article, I’ll provide you with six tips, as well as some product resources, for discouraging birds from becoming too friendly with your equipment. After selecting sensors that will meet your application needs, such as accuracy requirements, look to see if there are available sensor options or accessories designed to prohibit bird interference. For example, you may select a rain gage with a spike strip to prevent birds from nesting on the gage, or you may select a net radiometer (such as the NR-LITE2-L) that has a rod to deter birds from roosting on the sensor. The WXT520 Weather Sensor, as another example, has an optional 25300 Bird Spike Kit. The spike kit discourages birds from roosting on the WXT520 without hurting them. The kit is fastened to the top of the sensor with the spikes pointing upward. The shape and location of the spikes ensure minimal interference of your wind and rain measurements. 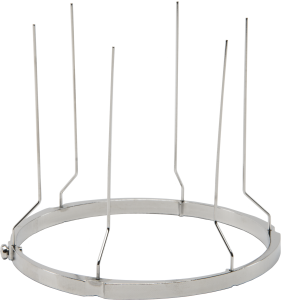 UV-resistant cable ties, such as the 17592 and 7364, are provided with Campbell Scientific tripods and towers. You can also create a “bed of nails” with these ties to prevent birds from landing on masts and crossarms, or even on the arms of sonic anemometers. Using a pipe clamp, you can strap a strip of bird control wire around the funnel of a tipping bucket rain gage. 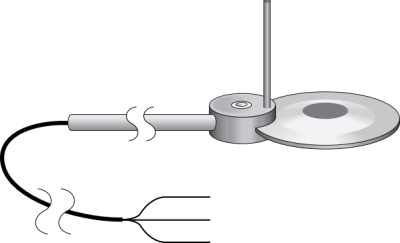 The needles of the wire should extend up beyond the funnel to prevent roosting. If birds have another option for perching, they may leave your equipment alone. If it’s feasible, you can install a perch away from your equipment. If that’s not an option, you can install a crossarm (just for the birds to perch on) that is higher than your wind sensors. Just be sure to position the perch so it isn’t directly above any other equipment. Stretch fishing line across the top of the bird landing zone. Ensure the fishing line is two to three inches (5.08 to 7.62 centimeters) above your equipment to help prevent interference with your measurements. Consider installing a visual deterrent, such as a realistic-looking owl decoy. Mount the owl so that it swings and doesn’t become a static figure that the birds become acclimated to. A hawk, for example, may be inclined to attack an owl decoy rather than your equipment. Bird-B-Gone – Products include bird spikes, netting, deterrents, repellents, and visual bird deterrents. Bird-X – Bird products include spikes, netting, visual scares, and predator decoys. Nixalite – Bird control products include bird spikes, netting, repellents, and deterrents. Weather station performance and data accuracy can be affected by birds that roost, nest, or leave droppings behind. To minimize your maintenance needs and costs, as well as prevent the potential loss of usable data, consider implementing one or more of these tips. Credits: Stephen Smith of Wade Water LLC and Buena Vida Farm provided the owl photo. Have you had issues with birds and your equipment? Do you have any bird control tips or stories to share? Post them below. Robin Deissinger is the Web Content Specialist at Campbell Scientific, Inc. She creates and maintains content on the company website, and she manages the corporate social media program. Robin serves as the blog editor for the Campbell Scientific Blog and occasionally contributes blog articles. She has a bachelor's degree in Communications from Bradley University. View all articles by this author.